I feel quite strongly that Kate Spade and I might be BFF’s if we ever met in real life. (Is there a real Kate Spade?? I should probably know this.) I mean, obviously she loves color, classic style, and sometimes quirky quotes. 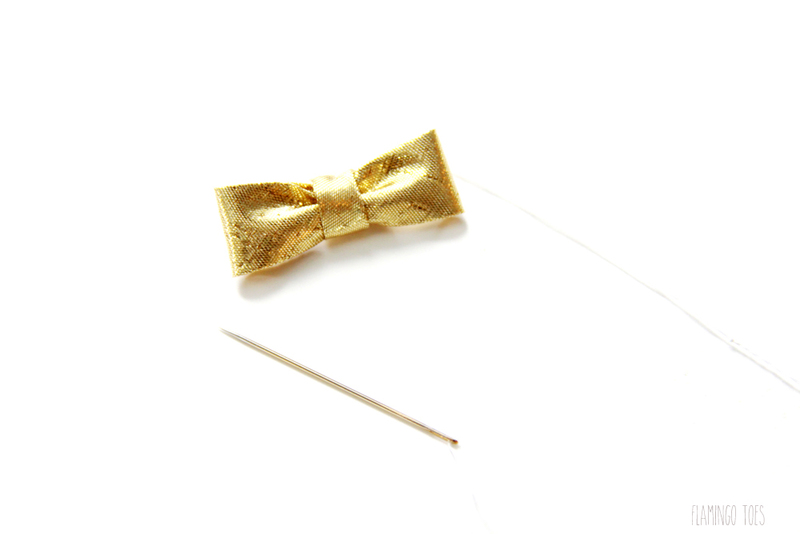 And we can’t forget gold bows. It’s a match made in gold polkadot heaven. I’ve been wanting to come up with quick and fun give ideas, that are also easy and super cute – and I thought I’d make something that was inspired by all things Kate Spade. 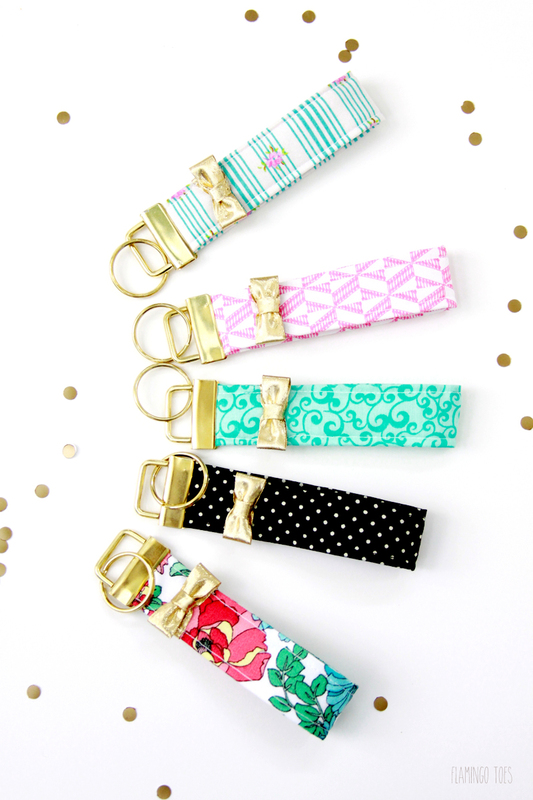 These Kate Spade Inspired DIY Key Fobs fit the bill perfectly – they are quick to sew up, (you can totally do this as a beginner project) and they are so sweet! 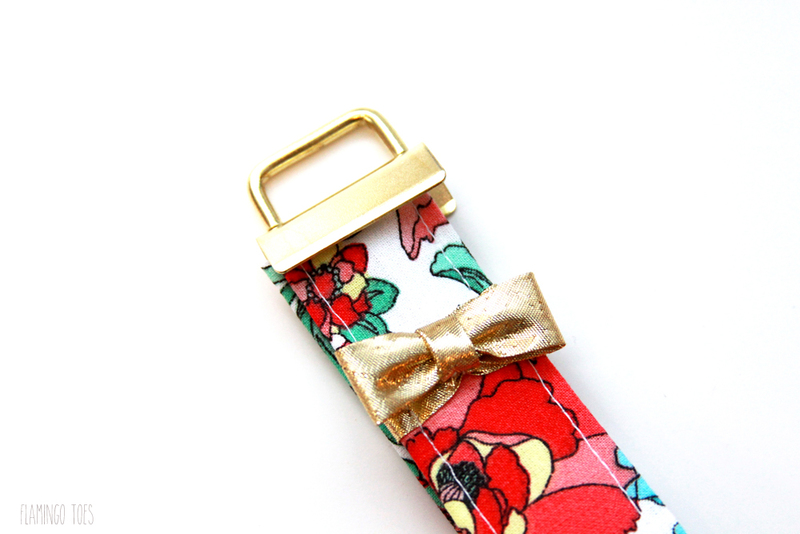 They are bright and colorful and they have the cutest little gold bows – I think Kate would approve don’t you? Maybe you don’t love all the glitter and stuff – that’s totally ok. I think they’d be great with an aztecy feel, or maybe something geometric! Any little print that you love will be perfect. These little babies are so fast to sew up too. You can make one up in 15 minutes easy. 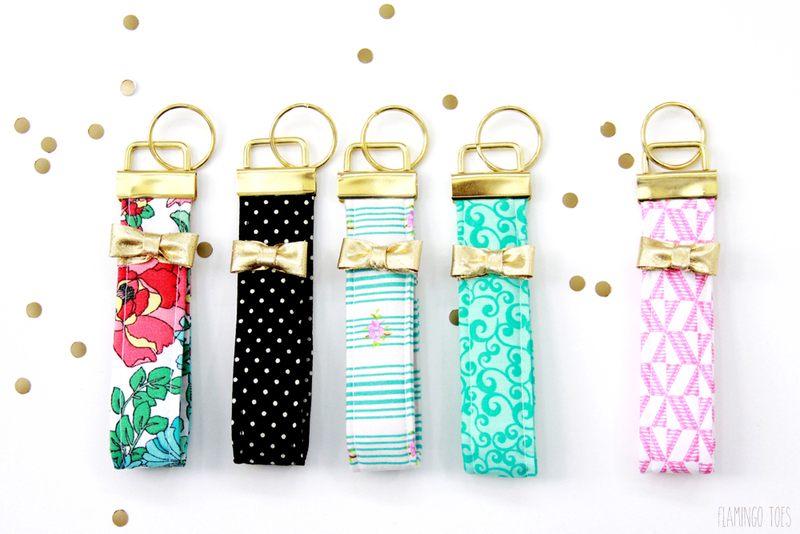 You could sew up a key fob for mom, one for you, and a few for your girlfriends in just an hour or so. 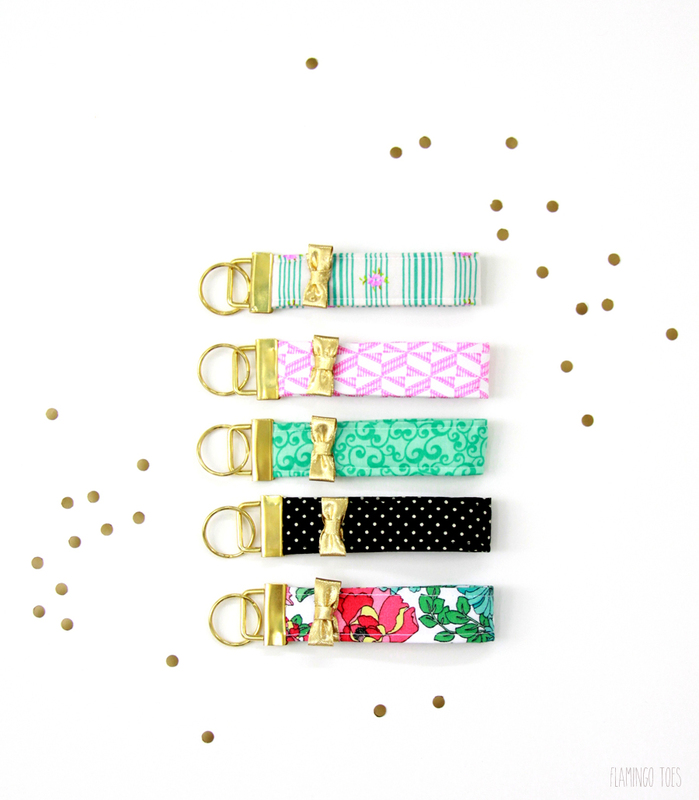 Key Fobs for everyone! So let’s get to the easy tutorial! Begin by ironing your fusible fleece to the wrong side of your fabric. Center it in the middle of the fabric piece. 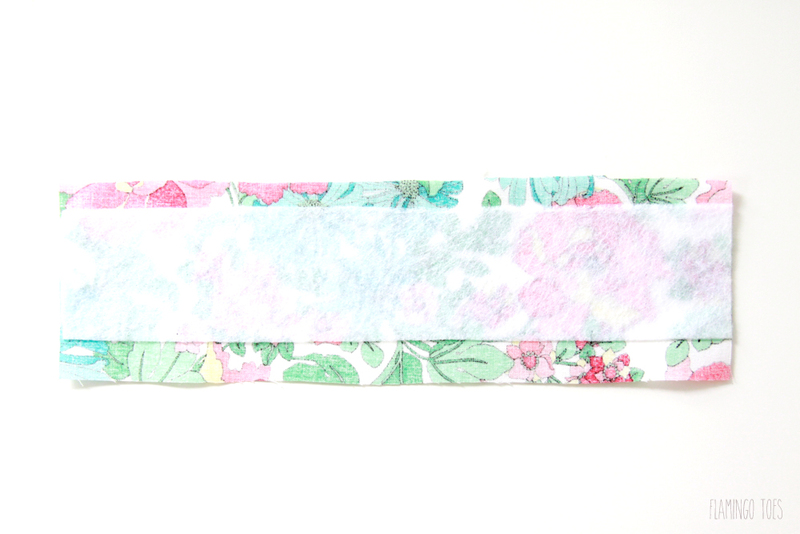 Fold the long sides of the fabric strip in 3/8″ on each side. Press these folds in place. Fold the fabric in half so the long edges are together. Press in place. 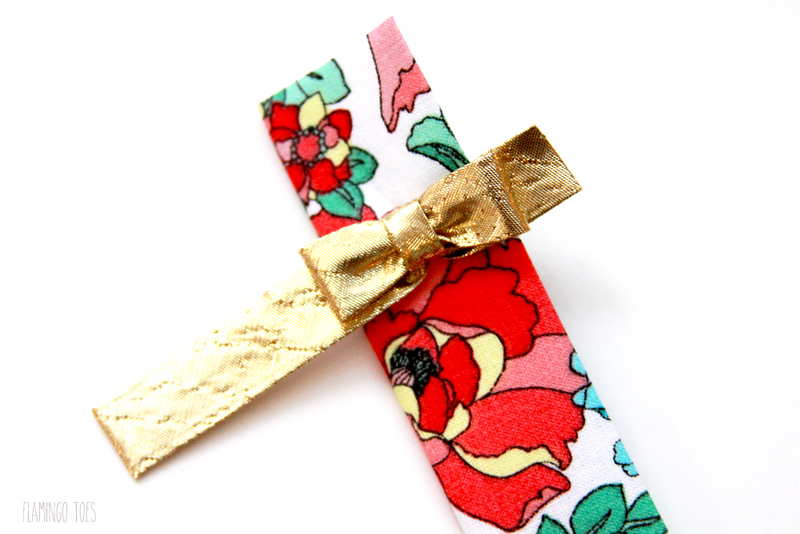 Create a small bow about 1″ wide from the gold bias tape. Sew it together by hand. Cut a length of gold bias tape about 4″ long. Measure down on the fabric strip 1 1/2″ and place the strip so the ends will fold into the open section of the fabric and the tape will wrap around the fabric. Sew the bow in place on top of the bias tape. With the bias tape tucked into the center of the fabric, pin the opening closed. Sew down the edge of the fabric strip, sewing the opening closed at the same time. Turn the fabric piece and sew up the folded edge as well. Make sure you move the bow as you sew so it’s not sewn down. Fold the fabric strip in half, bringing the two short ends together. Tuck the ends into the key fob clamp. Clamp the hardware closed. You can use a key fob clamp, or regular pliers. If you use regular flat nose pliers, wrap some felt around the pliers to protect the hardware. 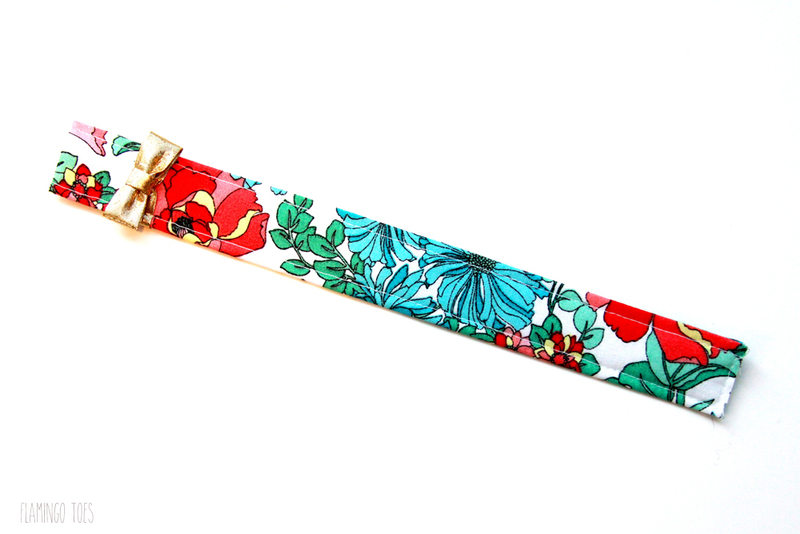 Now you have a super cute little floral Bow Key Fob! These are so addicting and quick – you will be wanting to make up more before you know it. I’d love to see a photo if you make some up! Oh my goodness, these are so pretty! I am definitely in the ‘beginner’ category when it comes to sewing but I think could actually make these. :) I love the gold bows! I’m a beginner, also and this looks fast and easy. Can’t wait to make these – I need some cute graduation gifts, and these will be perfect. These are just too sweet! Thanks for sharing the tutorial! Oh I have to make these. They are awesome a simple. I can’t see but I think I can make these. Thank you for sharing such cool crafts. Sorry my iPhone changed my spelling. It was suppose to say I can’t sew. 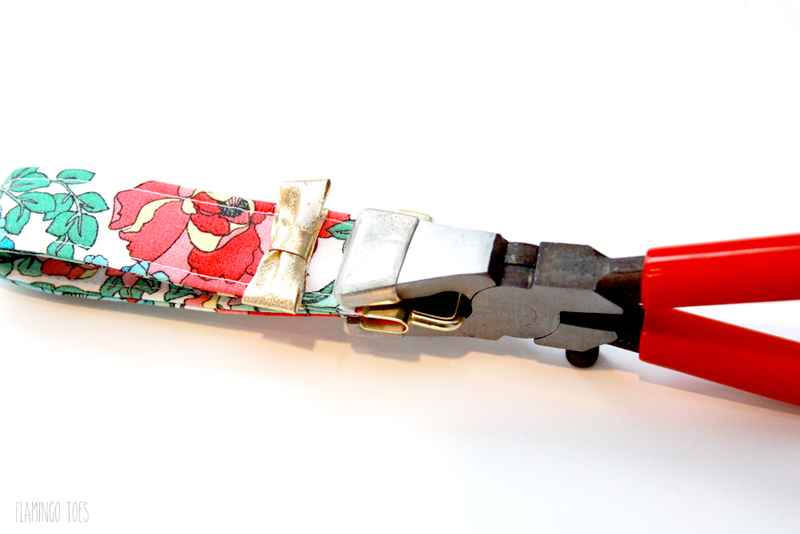 The Etsy shop I bought mine from is here: http://www.etsy.com/shop/bagladyofsc I also found the clamp tool there. I LOVE this!! I know just enough about a sewing machine to be dangerous :-) Even though your instructions are clear, to most people, I have re-read over and over the part about this bias tape. I understand the piece is no longer folded in half – ok. So, are you tucking the ends of the tape under the edges of material and gathering until the tape is taught? I would take the tape off in order to sew the bow on, right? I know I’m making this more difficult than it is, but I can’t for some stupid reason get past this part! I feel so dumb and I’m sorry to ask such a dumb question – maybe I should just move along? LOL Seriously though, I would love to make these. What an awesome idea!! Thank you very much for your help!! It’s not a dumb question at all! Let me try and make it more clear. You want to make the bow first. Email me if you need help with that part. Then cut another piece of the bias tape off the package – about 4″. You’ll take that piece as it is (don’t open up the tape) and lay the tape over the folded fabric so it overlaps the open side about 1/2″ and the folded edge about 2 1/2″. You’re making a “t” with the tape and fabric. You’ll open up the fabric a bit and tuck that 1/2″ into the opening. Then you’ll wrap the 2 1/2″ around to the back of the fabric and tuck the 1/2″ that is left over into that same open section. Basically you’re just wrapping the bias tape, without opening it, around the fabric piece and tucking the two ends into the side of the folded fabric that is still open. You’ll sew the bias tape in place when you sew the sides of the fabric. Please let me know if that doesn’t seem clear enough, I’m happy to help! 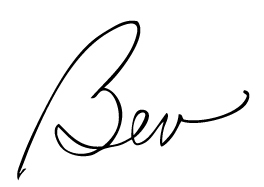 Feel free to email me at bev@flamingotoes.com. Thanks! I love the key fobs but I can not sew at all. Is there anyway I can purchase them from you. I do not own a sewing machine and my high school sewing class did not work out well for me. These fobs will make great birthday gifts for my granddaughters and girlfriends. Hi Helen, So sorry, I just don’t have time to make them up to sew! I hope you can find someone to help you out! These are adorable!! Fun patterns? Bows? Gold? Right up my alley. Thank you for sharing this easy (enough) tutorial! I used 1.25 inch clamps. :) Thanks! These are so flipping cute! I have most of this in my sewing room right now and I want to make one immediately! Thanks for posting this! Repinned! I LOVE Kate Spade and these are so cute!!! Thanks so much for sharing at Share The Wealth Sunday! I love key fabs! It helps me find my keys in my purse. I will have to try making one of these.Small Victories Sunday Link Up! I absolutely LOVE this! This totally makes me wish I could sew! 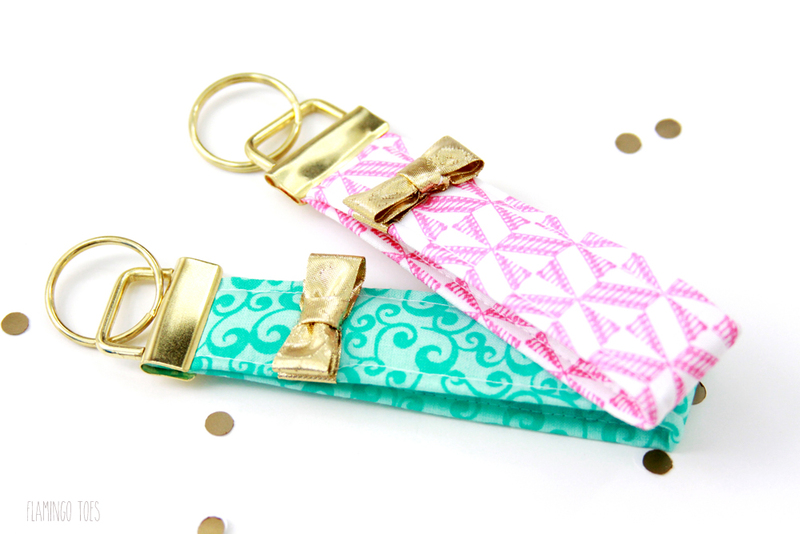 The key fobs are darling! I’m so making these! They do look really simple but they are so cute! I’m loving the little bow. I’m stopping by from the Sunday link up! These are really fun. I love the fabrics you used. I always have scraps of fabric laying around! These are super cute! I’m overdue for a new addition to my keychain. Pinning these for later when I have time to be crafty. Thanks for sharing! These are beautiful, and would make excellent gifts! Thanks for sharing with us at Totally Terrific Tuesday Link Party. Be sure to stop by Sparkles of Sunshine tonight to see your feature! Gorgeous material patterns. 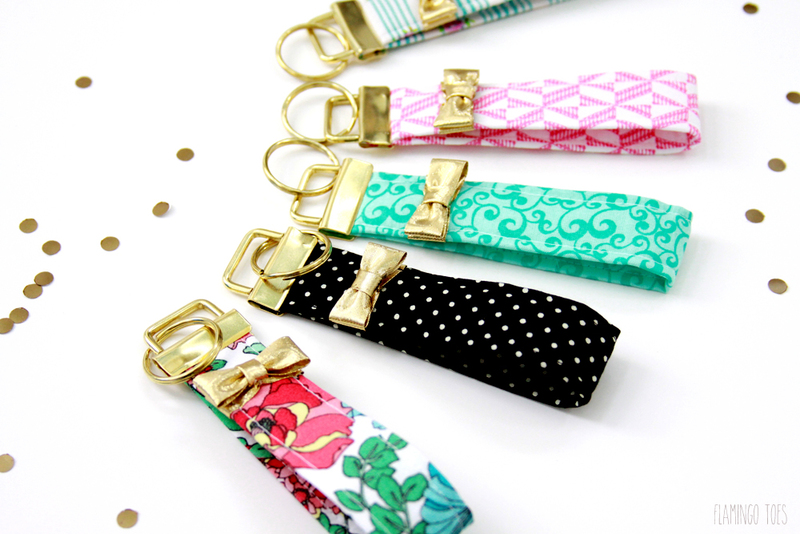 Did you use 1.25″ key fobs? Thanks. Wow these are soo cute!! And you can totally use any fabric design! Love it!! 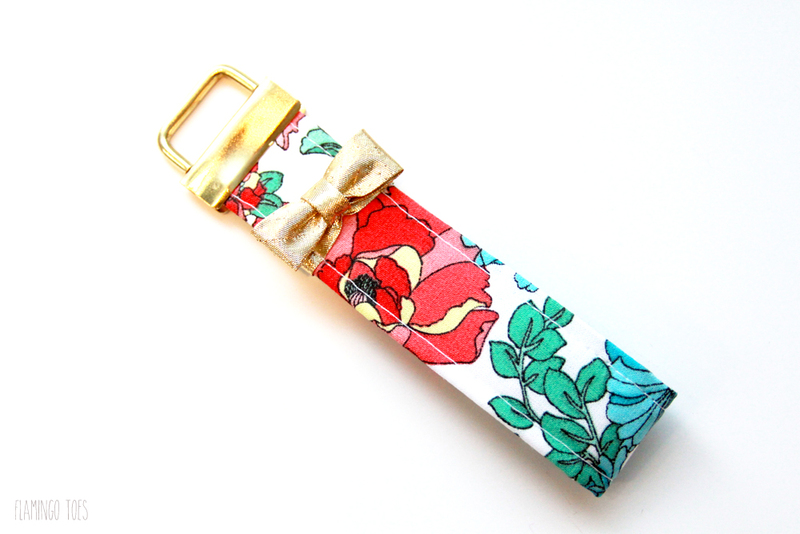 Can you please share your supplier for the gold key fob hardware? I was not able to find it anywhere etsy, Amazon or eBay. These are so cute and & I want to start making them for Christmas gifts. I just love these so much! They are so cute! SUPER CUTE! 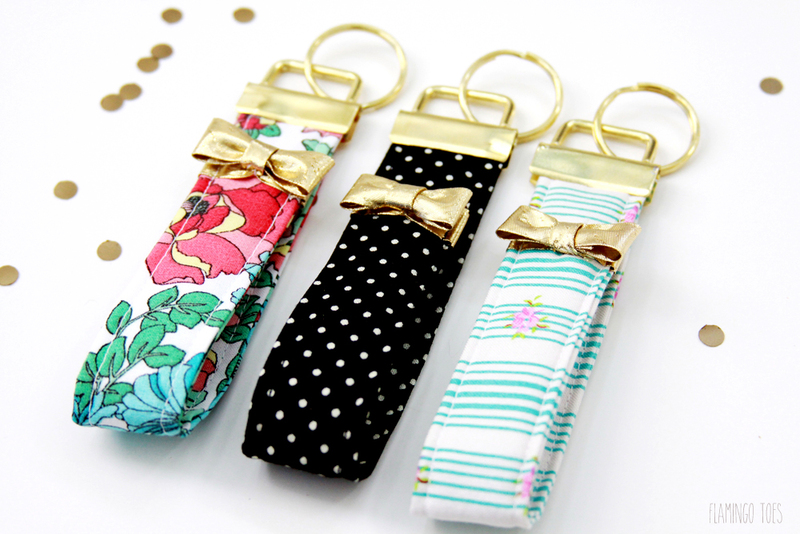 I adore these key fobs. 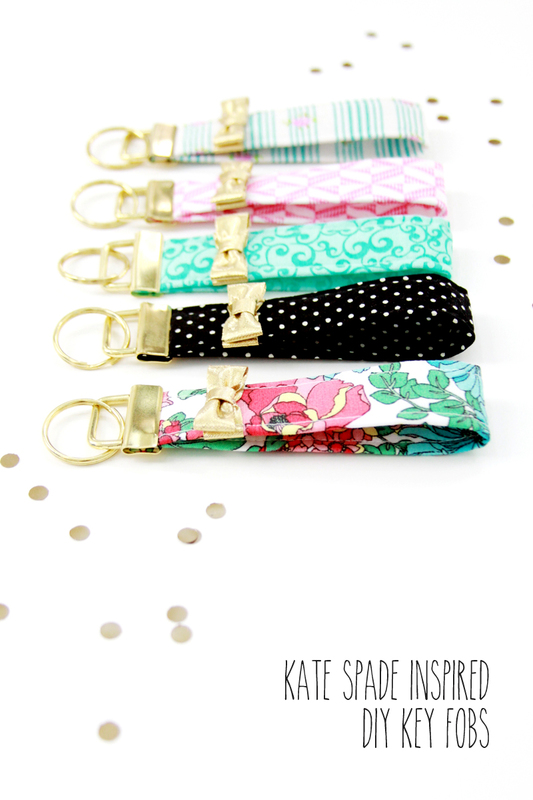 I will be including them in a roundup of Kate Spade inspired projects on my blog. Yes, there really is a Kate Spade. She has a very interesting story to tell on how she first got started. She made her first mock up handbags out of burlap and sold the designs to a big fancy department store in New York, where she got her first order (yes, all they saw were the “burlap” mock ups)! Her and her husband run the company. 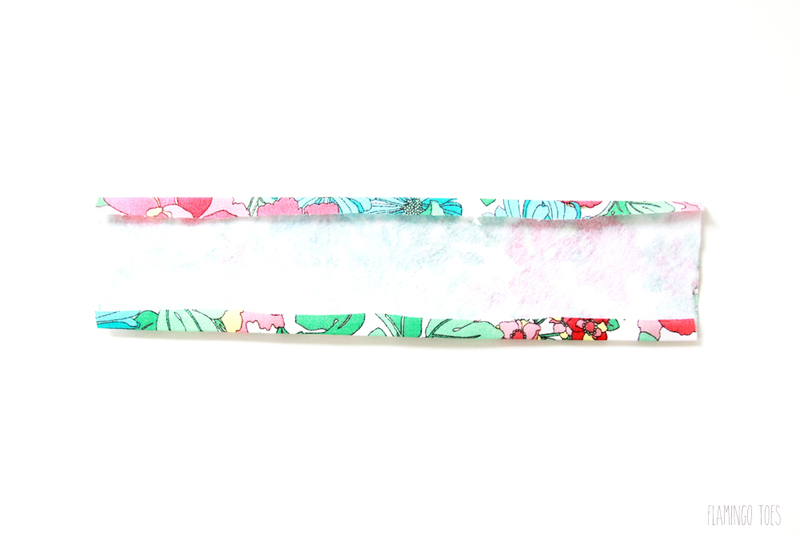 I just made this using your pattern, I extended it to 12 inches so it would fit around my wrist. Thanks! I LOVE these!! They are so adorable. Where did you get your fabric? It’s so pretty! Thanks Jessica! These fabrics all came from Jo-Ann a couple years ago – I’m not sure if those prints are still there or not! They are fun though aren’t they? Very nice work! What is the best way to make the gold bow? 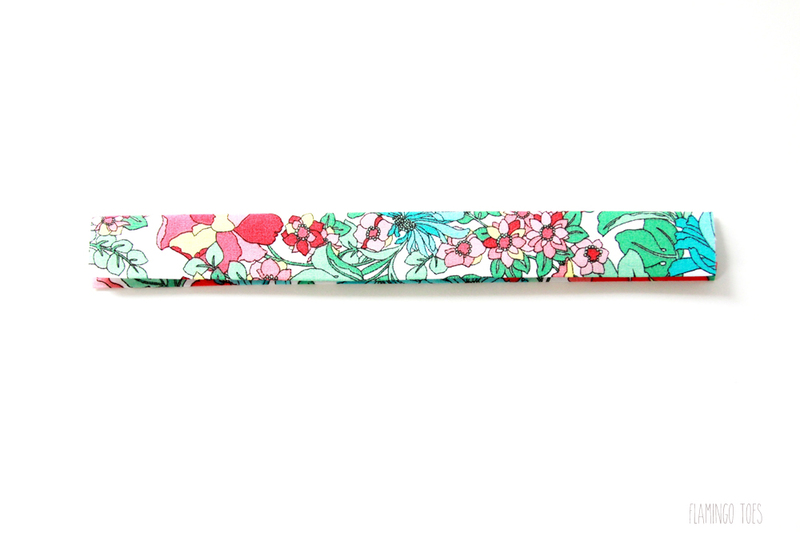 I’m challenged when it comes to making nice neat bows… Thanks!